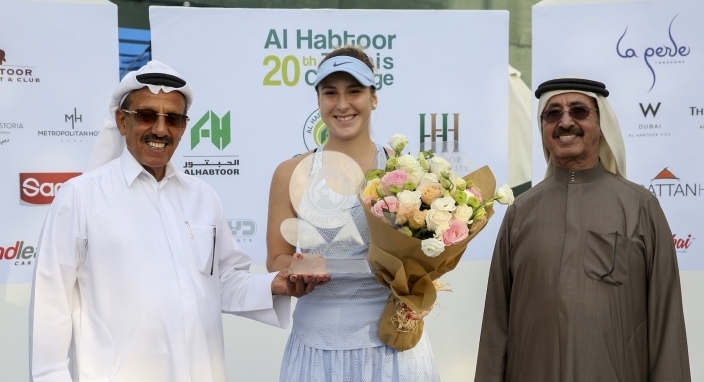 Dubai: Switzerland’s Belinda Bencic helped herself to a third successful week on the trot when she clinched the women’s singles crown after her opponent Ajla Tomljanovic retired injured in the final of the 20th Al Habtoor Tennis Challenge that concluded at the Habtoor Grand Beach Resort and Spa, on Saturday. Bencic, who had got the better of 2016 Dubai Women’s Open Champion Sara Errani in straight sets in Friday’s semi-final, won the first set 6-4 in 47 minutes and was then leading 30-15 when Tomljanovic walked up to chair umpire Ali Khatibi and informed him of her pullout due to a nagging groin. “I tried my best and I wanted to play here because I believed I could have won this title. Believe me, I am more sad than any of these people who have come to watch us,” Bencic told media later. A few years back, Tomljanovic missed out on the women’s Tour following a bout of mononucleosis [where a person loses a lot of muscle while always running a temperature]. She has shown tremendous resilience then to return to the Tour and climb up the rankings. “I gave it a good shot by turning up for the final, but every time I moved I felt a sharp pain and I just couldn’t continue. I am tired of playing with pain all the time. I can only hope that this is a something of a small injury and does not continue,” she added. No doubt, Bencic was a worthy winner after coming in to Dubai with back-to-back $125,000 ITF Women’s titles in November itself. The 20-year-old Swiss had earlier won in a $100,000 tournament in Saint Petersburg, Russia in September and lost in the semi-finals in Poitiers, France a month later. “I am very happy that I have achieved a first today while finishing the year on a winning note. Coming here I was totally focused on winning this one and signing off so that I can now continue my preparations for next season,” Bencic said. “No doubt, this is a great occasion for me and my career and hopefully I will have many more such ends in the future,” she added. Bencic, who rose to a career high of World No. 7 in the second half of February last year, fell outside the top-100 earlier in 2017 due to lop-sided results. But the 20-year-old has signed off well with hopes of doing even better as she settles in to continue with her off-season preparations right here in Dubai till her departure to Australia on December 23. “This should be a good week for me here,” Bencic said. “I am eagerly looking forward to just relaxing and continue with my training for 2018,” she added. Her first task Down Under will be in January when she joins 18-time Grand Slam champion Roger Federer for the Mastercard Hopman Cup in Western Australia. “I’ve done the other things one can do in Dubai. I took my mum to the mall a few days back and gave her a present. Now it is time for some rest and training and then onward to Australia for my first tournament,” Bencic said. Khalaf Al Habtoor, Chairman, Habtoor Group was joined by Shaikh Hasher Al Maktoum, President, Tennis Emirates, in the presence of Dubai Duty Free Tennis Championships Tournament Director Salah Tahlak while handing over the trophies to the finalists.